Malcolm Christie was a non-league player who stacked supermarket shelves before he joined Derby County in 1998. The Lincolnshire-born striker transferred from Nuneaton Borough to Derby for just £50,000, but went on to score in the Premier League, make more than 100 appearances for the Rams and even score the winner against Manchester United. We spoke to Christie in SBW Episode 10, where he candidly described his glory days at Derby, being tapped up before his transfer to Middlesbrough, and his anguish at having to retire at just 29 due to injury. Below is a transcript from part of the interview – listen to the whole episode further down. SBW: Malcolm, it’s really good of you to give us your time. We want to dive straight in and address the burning issue – a quick yes or no here – should that goal against Man Utd have been allowed, in 2002? MC: The one for my hat trick? Nobody had scored a Premier League hattrick against Man Utd at that stage. Alex Ferguson even said after the game that it should’ve stood. The referee made a very quick decision in fairness – I remember thinking I better have a look before I make a fool of myself celebrating, and he’d blown the whistle. SBW: You retired in 2009 and took up a more unusual career away from football, can you fill us in on what you’re up to these days? MC: I work at a car dealership in the north-east, which I made my home after signing for Middlesbrough. I’m a sales manager for Jaguar now – it’s a left field decision away from football, but I’ve progressed well in the past five years. SBW: The story goes that you were stacking supermarket shelves when the call came from Jim Smith, who bought you from Nuneaton Borough for £50,000. How did that deal come about? MC: It was a big moment in my life. I wasn’t there for that long, but I was scoring in pretty much every game. The scouts would come from all the Premier League clubs, but it would inspire me. For a kid who was stacking shelves, fast-forwards a few months and a Man Utd scout is watching, I absolutely loved it. Jim Smith wanted me to play in a trial against Boston Utd – but I didn’t play well. The ball was bouncing off me, and I thought nothing of it – but the call came in the next day saying Derby wanted to sign me. I got the call, we went to the stadium, and David Speedie (his agent) did the rest. I stood in an office and they said, ‘This is what they’re offering you.’ To go from paying to play football – I was playing to supplement my wages at the supermarket – all of a sudden a contract is put in front of you with bonuses and loyalty payments, it was a shock. SBW: What was the difference between playing for Nuneaton in the Conference to Derby in the Premier League? MC: My game didn’t change. The first training session was at the BBG, and I remembered being so excited. These people that you watch on the tele, suddenly I was training with them. In my first training session, Jim Smith put me up front with Paulo Wanchope. I got myself a lot fitter, I worked on my first touch, I worked on my game. A lot of the freedom got knocked out of me – I was fearless when I came to Derby County, but when you start playing for a team who aren’t successful, you have to adapt your game. You can’t do the fancy flicks, you can’t go on that extra run and beat the man. I look back at my career and think perhaps I should’ve tried to become more of a flair player. SBW: Did you have any players in that team who were mates? MC: When I went in there I wasn’t a name, so in a way I had to earn my reputation and start at the bottom. There were a few other young lads there at the time, and you had to look after yourself. I moved into digs – the club wanted me to move into the city – and it was a change. I was suddenly on my own and I had to work my way up. People who were there that I learned from, Stefano Eranio and Francesco Baiano for example, suddenly you were training with these guys and the skills you saw them do, you learned from that. It was always going to be a task for me to develop and get into that first team, but I always thought if I did well in training and reserve games and scored goals, Jim would give me the opportunity. I came on as sub for my debut at Hillsborough – we won 1-0 and Spencer Prior scored a header – and I remember thinking after the game, it doesn’t matter what I do for the rest of my life, I’ve played in the Premier League. I went back to my home town and no-one had ever done this in my home town – and no-one still has. I was just a kid, and I went back to the college and everyone was so proud of me, I felt ten feet tall. It wasn’t arrogance, I’d just done something with my life. SBW: What was Jim Smith like as a coach? MC: I was petrified of him. Because he signed me, and took a punt on me, he was hard on me because he wanted me to do well, and because he knew I’d respond to it. It was the same for everyone. We’d be training and you’d see Jim walk down the stairs and everyone would be like, ‘He’s coming’, and the standard would go up. Some players couldn’t deal with it, having him watch you in training, and some players it inspired. Once I was put clean through in training, and I tried to lob the keeper. He said, ‘What did you do that for, get off!’ and he sent me off from training. 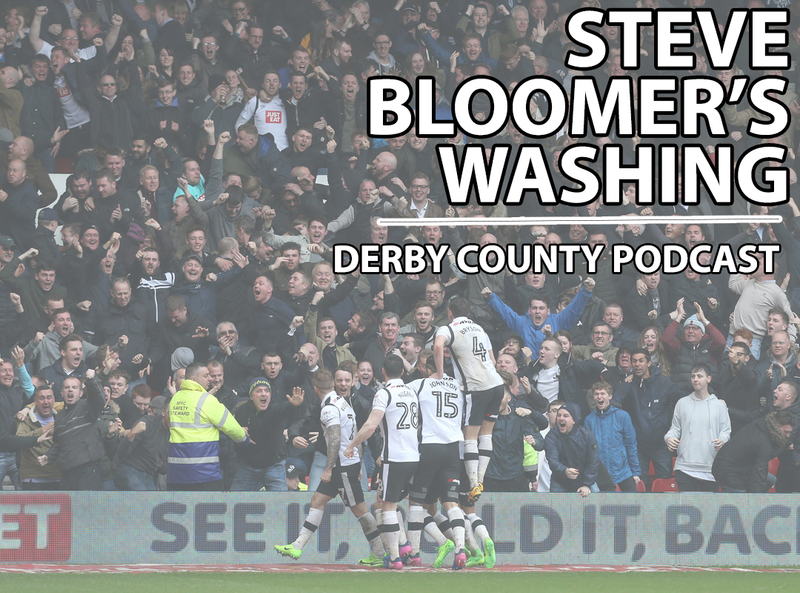 SBW: You scored the goal at Old Trafford which saved Derby from relegation – talk us through that one. MC: I was on a barren run of not scoring, and we’d had a couple of seasons where we’d struggled. It was hard. It all came to a head where we had to go to Old Trafford and get a result. Before the game Jim put the Utd team up, and I remember thinking, ‘We can beat them’, because Ferguson had rested a few players. David Beckham and Teddy Sheringham were still playing, and Barthez in goal, but we were all up for it. The game panned out fantastically for me because I scored the winner and it was a dream come true, and it was the highlight of my career. It was an emotionally draining day. SBW: How did you celebrate? MC: We enjoyed ourselves. We’d played hard, and we all met in a bar in Derby after the game. I remember sitting in the bar when Match of the Day was on – we were sat in the corner but word had got around that we were in there – then the goal went in. It was a great game and a great night. One thing that did make me laugh was my miss in the second half. The night I went out, I thought all anyone would want to talk about was the goal, but all people wanted to talk about was the miss. I’d just scored the winning goal at Old Trafford! It was a great moment not just for me, but for the team. I’ve got pictures in my house of me jumping on (Mart) Poom’s back when we’re celebrating. It was the best I’ve had in football. SBW: How hard was it to transition out of football into a normal life? MC: It was so hard, because football was my life., Nobody wanted to know me, the phone stopped ringing – suddenly the agent who’d helped me my whole career, I was ringing him and I thought he was a friend, but you’re just a commodity, a piece of meat. You go from walking about and knowing that people will recognise you – not that you always want them to, but it’s just human nature – to suddenly people don’t recognise you, and the ones that do just want to talk about your injuries. You end up becoming someone who doesn’t want to leave the house. SBW: Did you carry on watching football after you retired? MC: I just couldn’t face it. These players that I played with were suddenly on the tele, and they were doing what I wanted to do, what I’d dreamed of doing, and what I couldn’t do anymore. It took two to three years to get over the mental side of things. I’m still proud of what I’ve done. From nowhere and absolutely nothing, I did something with my life and scored goals in the Premier League.